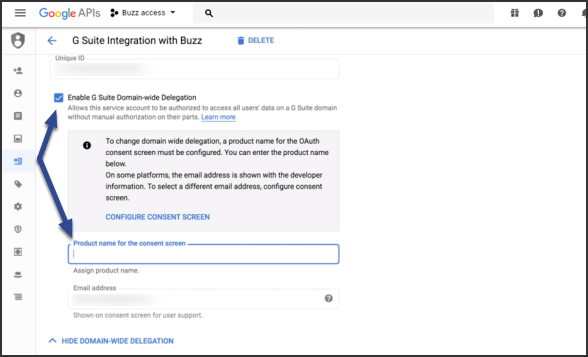 Automatic integration with Google Drive (Learn more): Most Buzz domains are automatically integrated with Google Drive, allowing users to use Google Drive documents in Buzz as long as they have a Google account. This integration does not include collaborative tools. 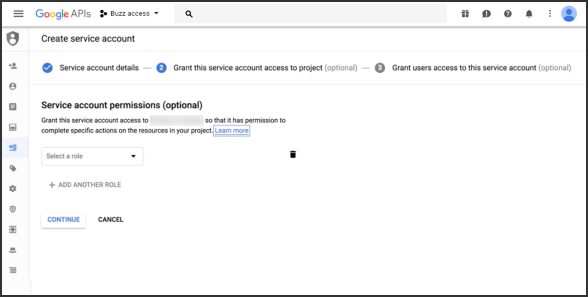 G Suite integration (covered in this article): This integration requires more setup, requires users to have a Gmail address attached to their Buzz account, and enables collaborative tools. 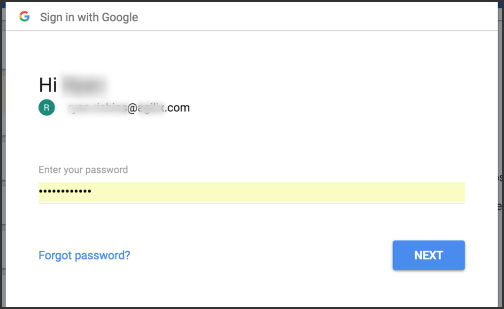 You must create a Google service account. You must enable it in Domain Settings. Any Google Cloud Platform resources that you allocate and use must belong to a project. You can think of a project as the organizing entity for what you're building. A project is made up of the settings, permissions, and other metadata that describe your applications. Learn more about projects. If you already have a project that you want to use, you can skip to Step 2. Enable the Google Drive API. Go to the Google Developers Console (https://console.developers.google.com/project) and sign in as a super administrator. Click Create project. If you haven't used the Developers Console before, agree to the Google Cloud Platform Terms of Service. Then, click Create a project. Edit the Project ID if you want. Select the desired Organization and Location from the appropriate dropdown menus. In order for Buzz to interface with the Google Drive API, you need to enable it. 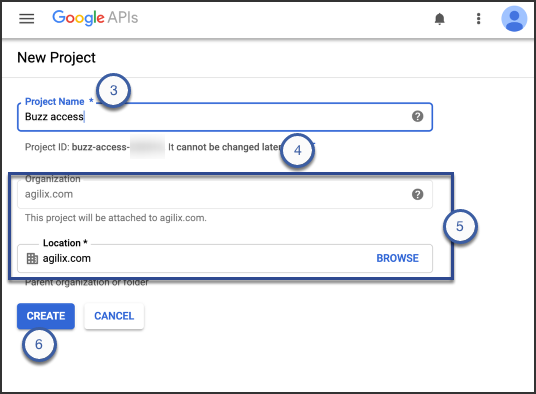 Go to the API dashboard (https://console.developers.google.com/apis/dashboard) and select the project you created or selected in Step 1. Click Enable APIs and Services in the Dashboard. Search for Google Drive API and select it from the results. 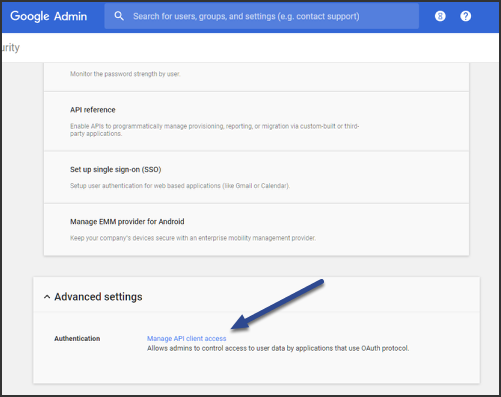 In order for Buzz to manage permissions effectively, it needs access to your Google service account. Open the Menu in the top-left corner of the console and click IAM & Admin > Service accounts. Enter a title in the Service Account Name field. 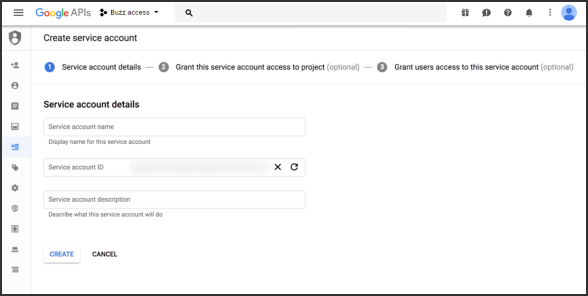 Describe what the service does in the Service account description field (e.g., Integrates Buzz with G Suite). You can set any optional Service account permissions you desire, then click Continue. Set up any optional user access, then click Create Key. Select JSON under Key type in the panel that appears on the right and click Create. You'll see a message that the service account JSON file has been downloaded to your computer. You will need it later, so make a note of the location and name of this file. Open the Actions menu and click Edit. Check the Enable Domain-wide Delegation box and enter a name in the Product name for the consent screen field (user whatever is most useful; only the system admin managing this integration will see this name). You can click the View Client ID link to review the service account you have just created. Copy the Client ID value. You will need this in Step 4. 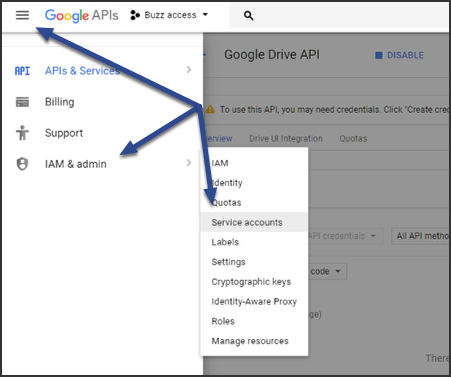 Once Google Drive API is enable, you need to give Buzz access to the service account. Your organization may have multiple active domains within your G Suite account (e.g., @studentemail.com, @teacheremail.com, @parentemail.com). If so, each of these domains need the client access you set up in these steps, and you need to repeat them for each domain. 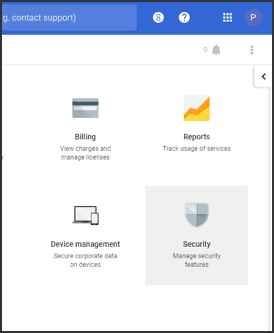 In your G Suite domain’s Admin console (https://admin.google.com), select Security from the list of controls. If you don't see Security listed, select More controls from the gray bar at the bottom of the page, then select Security from the list of controls. If you can't see the controls, make sure you're signed in as an administrator for the domain. In Security, select Advanced settings and click Manage API client access next to Authentication. In the Client Name field, enter the service account's Client ID. You should have copied this in Step 3, or you can find it in the Service accounts page. Select Domain settings in the more menu in the toolbar. 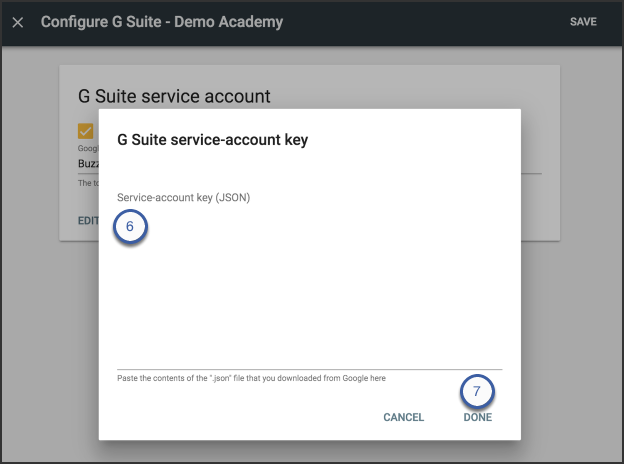 Check Enable G Suite service account box on the G Suite service account card. Choose the Google Drive folder name (this is The top-most Drive folder where Buzz stores documents). 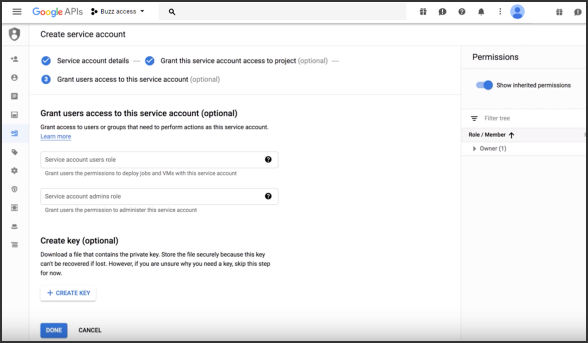 Copy and paste the contents from the .json file that Google provided when you set up your service account into this field. 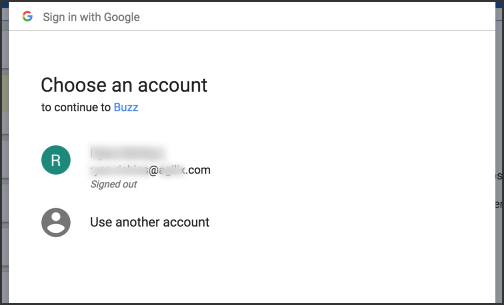 When users open Google Drive from Buzz for the first time, they may be asked to verify the access, sign into their account, indicate which account, etc. Review the possible requests pictured here. 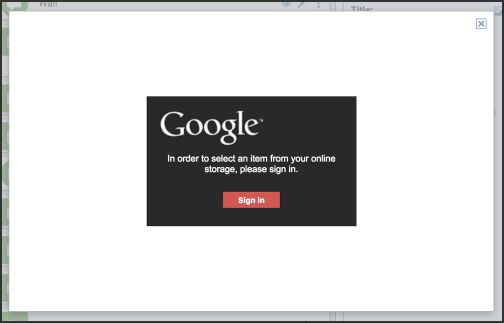 Users' browsers must allow Google to popup windows. If the Google Drive fails to create or copy documents, Buzz reports an error. 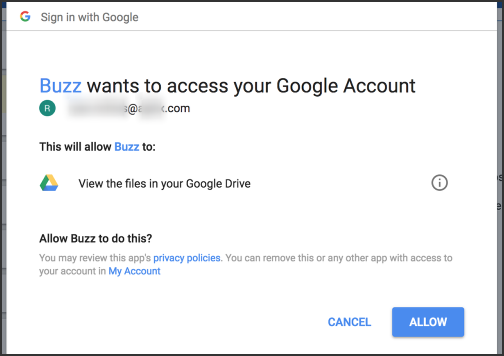 If the Google Drive cannot correctly grant permissions, Buzz does not report an error and users will simply ask for permission from the document author using Google Drive screens. If Google fails to generate a PDF snapshot, Buzz attaches a TXT file to the activity in the PDF's place, alerting you of the issue. Love the G-Suite integration! It's incredible! Hello - We are testing out the G-Suite Integration on testing domain, and I continually get this error in Buzz. I followed the tutorial above, and don't see where this error would occur. Thanks! This likely isn't caused by the G-Suite integration, but rather is due to the domain still using the Google Drive integration within the domain. 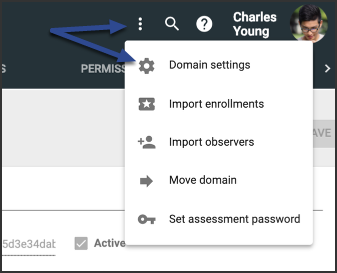 An admin will need to remove the custom Google Drive integration (this is not the same as the G-Suite integration) from the domain settings.